Everyone has had an experience with a Vincent McKenna (played by Bill Murray), a St. Vincent, and very few of them involve any form of redemption. St. Vincents are St. Vincents as a result of the demons that chase them into being the people they are, and those demons are, often, so powerful that they cannot be thwarted. Anyone that has read my personal experiences with Ellis Reddick, knows that I’ve had my own experience with a St. Vincent, and that I’ve been affected by his sociopathic tendencies in a subtle manner that I may never entirely shake. Ellis Reddicks, and St. Vincents, are considered ideal characters for horror movies and coming-of-age style redemptive movies. They are often nice people (in the coming-of-age movies) that require a viewing from a non-traditional lens, and it’s in that scope that they often find the redemption that no one ever afforded them before. Having said all that, St. Vincent is a really good movie for its honesty, and it’s all too realistic (for some of us) portrayal of a demon-ridden, lout that tries to take advantage of everyone around him, but as anyone that has watched a movie made in this century (the 21st century) knows, he’s not going to be such a bad guy at the end of this production, and in the version of reality depicted in this particular movie no one really is. The demons that chased Ellis Reddick are the same that presumably drove Vincent throughout his life, except for the alcohol and the stripper. The demeanor, the overall outlook, and the need for vices are all the same. Vincent McKenna is an alcoholic that frequents the track, and spends some of his day and most of his nights with a stripper in a seemingly asexual relationship. He tries to take advantage of everyone around him, including a banker, and a recently divorced single mother to fund his loutish behavior. With the banker, Vincent finds out that the money he’s received thus far from the bank, as a result of a reverse mortgage, has been completely tapped. The banker tries to explain the process of a reverse mortgage, and the idea that as far as the process is concerned, the bank can no longer afford to finance Vincent McKenna’s lifestyle. Anyone that understands this process, understands what the banker is saying, but Vincent (and thus the audience) believes that the banker could find a way to continue to fund Vincent’s lifestyle, and the fact that he doesn’t makes the banker a tool. The banker then becomes, in a limited manner that only characterizes Vincent’s current plight further, a bad guy. There is some struggle at this point, however, in totally believing that the banker is a bad guy. He looks at Vincent with confusion in a manner that suggests that his hands are tied, but the sympathy for the main character cannot be shaken. There is no struggle with the story of Vincent taking advantage of the single mother’s situation however. That is more blatant and –in an odd way that makes the audience uncomfortable– kind of funny. The John Nolte, November 14, 1014 review for Breitbart.com, suggests that the movie, St. Vincent, is basically trope-less, or as he describes it, “It isn’t a tropey-trope.” I’m guessing that Nolte is stating that this movie isn’t so loaded with tropes that it’s totally derivative, and thus unwatchable. If this is what he’s saying, he’s right, but it’s still loaded with so many tropes that any serious review would probably have to mention the word to be taken seriously, even when they are attempting to dismiss the adjective. The primary reason to watch this movie, as with any movie Bill Murray is involved in is Bill Murray. 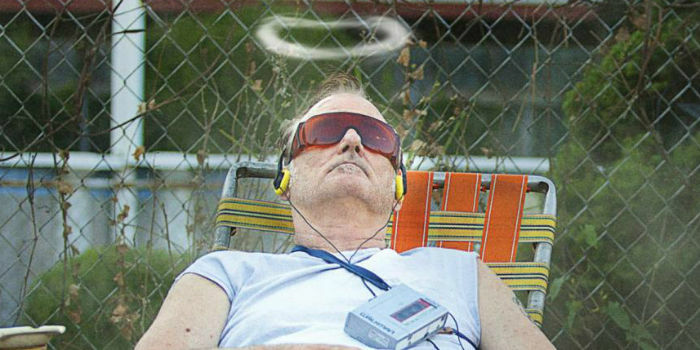 Bill Murray pulls his role off with the inexplicable, characteristic ease he pulls off every role. As Steve Martin once said of Bill Murray: “It can’t be that easy for him. It just can’t!” Inherent in Martin’s consternation is the consternation that Hollywood, the critics’, and most Americans display with their inability to understand why he is popular, and why they love him too. The consternation also suggests that there has to be some underlying philosophy, or effort to it all, that no one can see. If it were any other actor, most people would accuse Bill Murray of sleepwalking through most of the movies he’s done. He doesn’t appear to care about all that, and we love him for it. I love him for it. It may have something to do with what Bill Murray said, “I knew from the moment I finished reading the script for Ghostbusters that we would all be able to be late for the rest of our lives.” It may have something to do with, as Truman Capote once said, “All an author needs is one truly great book.” It may have been his years on Saturday Night Live, the movies What about Bob? or Groundhog Day, or the stories of “citizen” Bill Murray that have made their way into the zeitgeist, but one gets the feeling that if St. Vincent were his first movie, we would all love his performance without knowing why. If it’s true, as political philosopher Hannah Arendt says that “To think critically is always to be hostile,” then the reader could regard this review as hostile. Most critical thinkers prefer to think of a critical review as an honest review. Some critical thinkers rip apart commercials and cartoons. They may enjoy these vehicles, but they can’t shut that critical portion of their brain off, no matter how much they enjoy the presentation before them. Some may view critical thinking as negative thinking, or cynical thinking, and some may take critical thinking a step too far. The latter tend to think that the audience of that criticism can’t help but think that they are striving for the cachet that critical thinking can gain a person. Having said all that, Theodore Melfi’s directorial debut of his screenplay is very good. The primary reason for this, as I’ve stated, is that Melfi and Murray combined to characterize this Vincent McKenna character in a manner that recalled the Vincent McKennas I’ve known throughout my life. That alone, in my opinion, makes the movie worthwhile. As the movie moves through this methodical characterization, we only love to hate Vincent McKenna more. Prior to the redemptive phase of the movie, the trope that we all have to suspect in a modern well-rounded movie, I was reminded of all of the St. Vincents I’ve known, as I worked my way through the confusing aspects of youth –looking for a hero to imitate or emulate– I found them all falling so far short that the St. Vincent redemption eventuality seemed both inevitable and incorrect to my experience with this type of person. Other than the fact that this curmudgeon, this Vincent McKenna, doesn’t have a tropey-trope-like, Scrooge-style redemption at the end, but all the surrounding characters do, I would point out that just about everything else in this movie has been done, ad nauseum, before. The most pervasive trope in this movie, and that which seems so pervasive in modern cinema, is that “there are no good guys, there are no bad guys. There’s only you and me babe, and we just can’t agree”. And if there are bad guys, they may be bad guys to traditional thinkers, but once viewed through a non-traditional lens, they can be something more, something better. The lens of this movie is, of course, provided by a child, the neighbor’s son, named Oliver. Another “bad guy” Oliver’s bully becomes a good guy after a more traditionally-minded style of beating. The audience’s focus then shifts to the villainous divorced Dad of Oliver. As the movie plays out, the audience realize he’s not such a bad guy after all either. The St. Vincent’s I’ve known were not Vietnam Veterans, and they weren’t retirees that had already lived a life when I knew them. When I knew them, they were fully immersed in the depths of their failure, so it may be unfair to equate St. Vincent with the curmudgeons and louts I’ve known throughout my life, but (again to the credit of the movie) they reminded me so much of some of the awful characters that have littered my life that I couldn’t help but feel cheated by the happy, redemptive ending. When it involves Bull Murray though, it’s impossible to leave angry.